The Claas Lexion 770 is a very special and expensive heavy-duty vehicle, which is used every day on fields around the world rice and wheat growing. 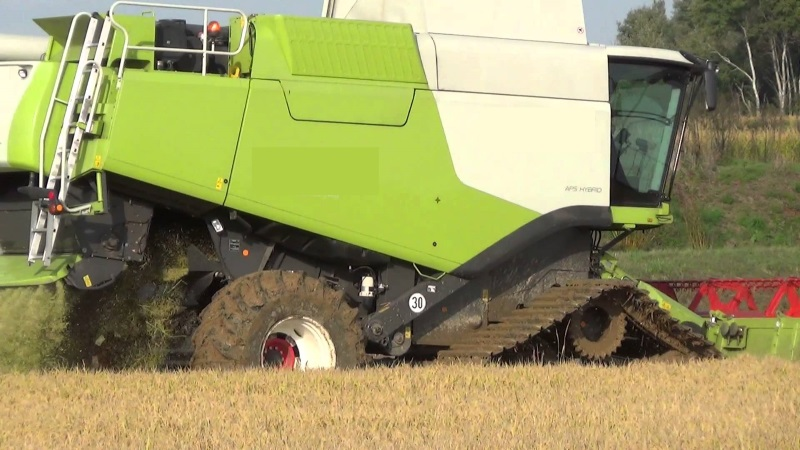 Claas Lexion 770 tuning is carried out to the 16L Mercedes-Benz engine using the Temic ECU by Viezu. Tractor tuning at Viezu . The series of Lexion combine harvesters by Claas dates back to 1995, and its great reliability and sturdiness gave life to a widespread production and an increasingly innovative and renewed range. When it was presented, it was the world’s most powerful combine with 40 wheat tones per worked hour. For this reason, during the years when this model was made, Mercedes-Benz, Caterpillar and Perkins have always struggled for the installation of motors, so we will have the possibility to find different types of ECUs mounted according to the year of manufacture, such as Caterpillar and Temic. System based on dialogue, such as CEMOS DIALOG or CEMOS Advisor that allow progressively optimizing adjustments based on a communication between the machine and its operator, who has to confirm or make the regulations proposed. CEMOS AUTOMATIC, generic name covering different automatic optimization functions of the machine and the corresponding processes. The operator has only to run automatic functions. These functions include AUTO CLEANING and AUTO SEPARATION for cleaning system optimization and ROTOPLUS for optimization of residual grain separation. All CEMOS AUTOMATIC functions permanently and automatically adjust the machine to the harvesting conditions required, ensuring maximum productive capacity with excellent quality and grain cleaning, in addition to minimum fuel consumption. The operator has only to enable automatic functions. This system mounts a triple combined harvesting rotor while separation is completed by rotors in the style of axial machines. But let’s start with APS, which consists of an accelerator, a main beater plus a launcher that has been designed to direct the product flow from the beater to the separation rotors. The processor or accelerator is used, as the name suggests, to suddenly accelerate the product before entering the beater: 3 to 20 m/s in a few centimeters. According to Claas, this is one of the APS system secrets since it causes the fall of about 20% of grains. This makes the beater action and obviously the separation rotor actions easier, and rotors will only have to cause the exit of residual grains from straw. As it is known, Lexion mounts two rotors with eccentric axle to increase the efficiency of ginning. The beater is 1.7 m long for standard 60-cm diameters and has a rotating speed of 395 to 1.150 rpm. The counter-beater is provided with a winding angle of 142 degrees and a total surface of 1.62 square meters. Let’s have a focus on the engine. In particular, on this Lexion version that mounts a Mercedes V8 with a 16k cc volume and SCR+DDP technology to limit exhaust. A fuel efficient Tier-4i motor capable of generating a maximum 1.800 rpm HP. It can reach 586 HP, equal to 431 kW. Rated power is 530HP, namely 390 kW. Speed is obviously controlled electronically and is based on single pumps provided with electromagnetic valves regulating power output. The cooling system is also very interesting. It has determined a small revolution in the combine harvesting world: there is no vertical impeller on the machine side any longer but a horizontal impeller located on the top. This results in more space for radiators and a cleaner impeller that self-protects from dust.